Monthly e-news from Charles River Watershed Association, an internationally-recognized leader in sustainable river management. Learn more at www.charlesriver.org . 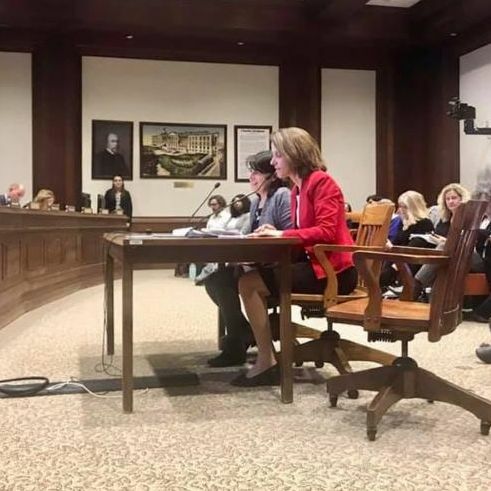 On April 2, CRWA Executive Director Emily Norton testified at the State House in favor of a bill that would require public notification of combined sewer overflows (CSOs) into the Charles River and other rivers across Massachusetts. Combined sewer systems are designed to collect rainwater runoff, domestic sewage, and industrial wastewater in the same pipe. (This design was an improvement over 19th century sewage ditches running along city streets.) During heavy rains the system overflows, discharging excess wastewater directly to rivers in order to prevent sewage from backing up into homes and businesses. Presently, there is no requirement for public notification when these discharges occur, even though contact with raw sewage is a demonstrated health risk . Emily testified alongside Julia Blatt from Mass Rivers Alliance. Other groups testifying included Mystic River Watershed Association, Connecticut River Conservancy, Environment Massachusetts, and the Merrimack River Watershed Council. We believe the public has a right to know when sewage is discharged into the environment. Furthermore, raising awareness about these frequent sewage discharges into beloved rivers will increase public demand to make the necessary wastewater system infrastructure investments to eliminate them. 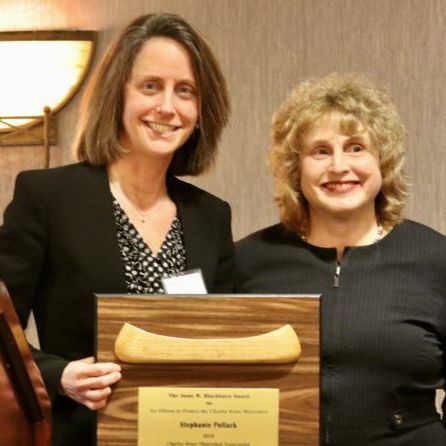 CRWA honored Massachusetts Secretary of Transportation Stephanie Pollack and several of the state’s leading environmental activists for their work in protecting and improving the Charles River at its 53rd Annual Meeting on Thursday, March 28 at the Newton Marriott. We look forward to our Annual Meeting each year as an opportunity to honor our amazing partners who help us restore and protect the river and celebrate all we have accomplished together! Read more about the night. 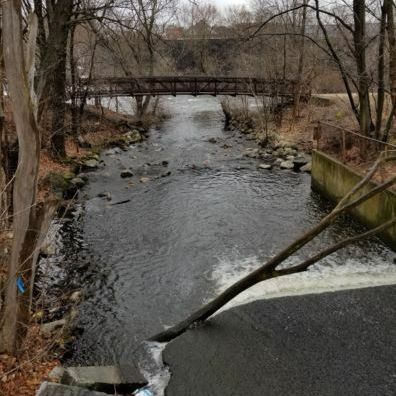 Our Volunteer Monthly Monitoring program now has an additional six sites on three tributaries in the upper Charles watershed, thanks to funding from the Massachusetts Department of Environmental Protection (MassDEP)! 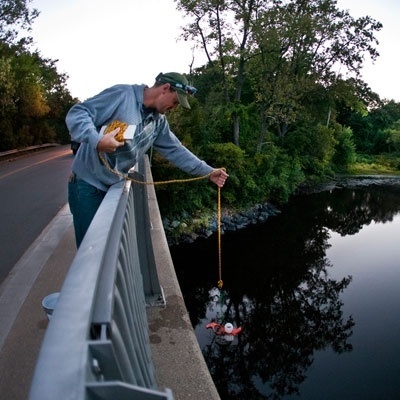 Additional tributary sampling will provide MassDEP with much needed up to date bacteria data on impaired water bodies in the Charles River watershed and increase our understanding of pathogen contamination in the upper watershed. Want to stay updated? Sign up for our Monthly Water Quality Newsletter. The Town of Norfolk, located almost entirely within the Charles River watershed, is one of many communities being affected by dense development. Norfolk’s drinking water supply faces numerous challenges which will only be exacerbated by climate change. 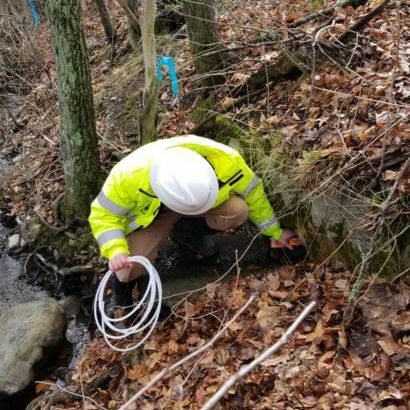 With a grant from the MassDEP, CRWA and the Town will partner to implement a campaign that will let residents know what they can do to reduce their summertime water demand and help get water back into the underground aquifers. CRWA will also identify opportunities for the town to infiltrate stormwater runoff. CRWA arrived on the scene of a gasoline spill along the Charles River at 9:45 am on Wednesday, April 3. 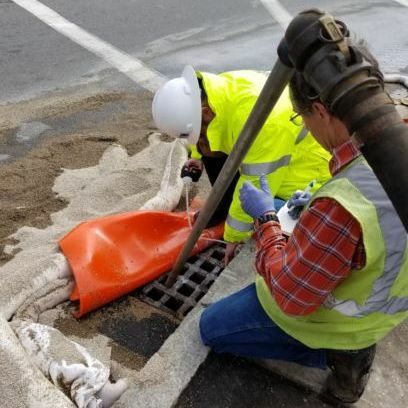 The spill occurred at a gas station at the intersection of California and Watertown Streets in Watertown early in the morning. MassDEP was notified and sent a response team. A tank that was not in compliance with current standards was overfilled, causing some gas to spill out. The Watertown Fire Department and Department of Public Works responded quickly and contained the spill. It appears that no gas entered the river, but MassDEP will monitor over the next few days. Edge Environmental will survey the area for infiltration in soil. It is another reminder of what’s to be gained from transitioning away from fossil fuels. There have been multiple sightings of white masses appearing on shad fish in the Charles, mostly forming on their heads. CRWA’s Aquatic Scientist, Lisa Kumpf, has been in touch with state officials about this issue and we hope to learn more about the cause. CRWA's beloved and talented Deputy Director and General Counsel is moving on to calmer waters. 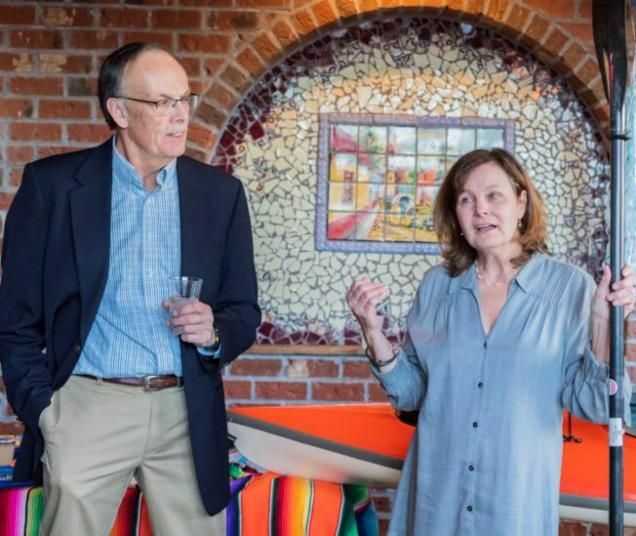 Margaret Van Deusen retired at the end of March, after a distinguished career of hard-fought battles, inspiring action, and tireless dedication. Margaret played a leadership role in the cleanup and restoration of the Medfield State Hospital site, and protected and enhanced public access all along the Charles. Thanks to Margaret, drinking water withdrawal and stormwater permits are more protective of the natural environment. To all of us at CRWA, she is a friend, a mentor, and a true “environmental hero!” Margaret, you will be greatly missed. All the best to you in your retirement and future projects! We’re excited to welcome back Catie Colliton as our new Water Chestnut Removal Program Volunteer Coordinator! 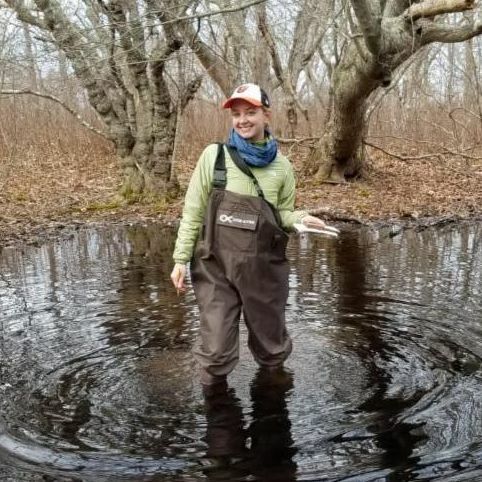 A former watershed science intern at CRWA, she conducted work with benthic macroinvertebrate to assess habitat quality at the Nantucket Field Station and is studying for a masters degree in environmental science at University of Massachusetts Boston, where she researches vernal pool characteristics and supports professors as a Teaching Assistant. During her time at CRWA, she hopes to contribute to the health of the Charles River watershed through coordinating volunteers in conservation efforts. Here’s some good environmental news: The Natural Resources Management Act (S.47) was recently signed into law! It included the previously expired Land and Water Conservation Fund (LWCF), reactivating its protections and making it permanent. For 52 years, LWCF has protected national parks and wildlife areas across the country. It has invested $223 million to protect Massachusetts’ outdoor places, from national wildlife refuges and working forests to ball fields and community parks. LWCF has protected Adams National Historical Park, Frederick Law Olmsted National Historic Site, Great Meadows National Wildlife Refuge, New England National Scenic Trail, and Cape Cod National Seashore. Help our friends at the Esplanade Association by taking 30 seconds to vote for them to win the ‘Landmarks Worth Saving’ Contest run by the American Association of Endodontists. The landmark with the most votes will receive $20,000 to their preservation fund and $30,000 in free endodontic services in the city in which it is located. Learn more and vote here. Pallavi Mande, CRWA Director of Blue Cities, will join other environmental leaders in a lively panel discussion and networking event for the Cambridge Science Festival . She will address how proactive approaches to climate adaptation and water management in the natural and built environment play a role in creating resilient communities. Learn more . There’s still time to take action for Earth Day and register for the Charles River Cleanup! Last year, the Cleanup earned national recognition from American Rivers for the Most Volunteers Mobilized and Most Pounds of Trash Collected . Help us continue this success-- sign up here! Kick off the paddling season with this year’s Run of the Charles: Boston's Premier Paddling Race, the largest flat-bottomed boat race in New England, drawing 1,500 racers and spectators each year! Join us and support a local environmental nonprofit, all while spending a beautiful spring day outdoors. Register here . Give back to your community while enjoying a spring morning along beautiful Haslam Pond in Westwood! Join CRWA to help out clear invasive bittersweet from the banks of Haslam Pond to restore the health of this small local conservation land. Learn more and sign up . View our Event calendar for upcoming events.